Select this option when your answer fully answers the question. This closes the question and starts the review process for other Ambassadors to review your response – the outcome of the review process dictates whether your balance is updated or not. What happens next? : This keeps the question open, the review process does not start until a full response is sent to the customer using the “Send Answer To Customer” option. If multiple Ambassadors have helped one customer the outcome of the voting process will determine how the question fee is split. Why is this needed? 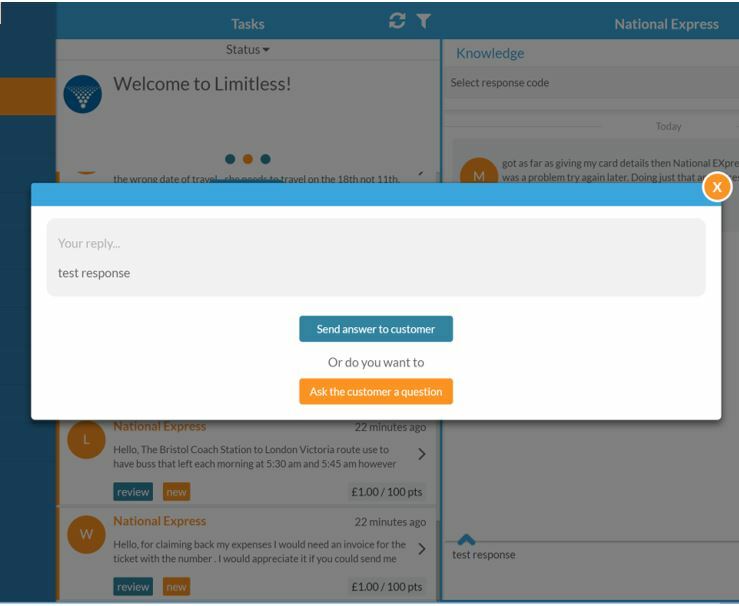 : If the customer replies back to your response once the question is closed, the Limitless platform will re-open the question. What’s the impact on me? : As a result of this to this you may from time to time see your balance change as the fees need to be redistributed to reflect the last voting outcome. The rewards and points will be distributed proportionally to the number of votes the answer(s) have received once the question has been closed. Make sure you always provide an answer to the customer’s question(s) and go above and beyond to help them so they get their answer first time.